No that isn’t a spelling error. This is a very real phenomenon that seems to be becoming ever more prominent in society. Being out of shape is so normal now that anyone who falls outside of this norm is seen as being abnormal and thus given a disproportionate amount of attention. Don’t get me wrong people are free to look and do what they want it’s when people express an opinion on other peoples appearance then we have problems. It’s a good thing that people don’t seem to be as concerned with people being out of shape as they used to be infact it’s awesome but that doesn’t mean it’s acceptable to make those who are in shape feel awkward or to level accusations at them. Whether these are born from jealousy or something else I don’t know but what I do know is it needs to stop. Holidays are a great example of this especially when around the pool. If an out of shape person walks past nobody will notice they’ll blend right in. If someone who’s in shape walks past everyone’s head turns like their some sort of freak and this will normally be accompanied by some form of derogatory comment about their lifestyle choices as if they are doing something wrong by being fit and healthy. Let’s face it as a species we aren’t designed to be overweight. We aren’t meant to 5-8% bf either, neither are optimal but we are supposed to be physically fit and relatively lean yet a very small percentage of the general population fall into this category and the ones who do get criticised for it. Anyone who’s in shape will be familiar with the criticisms, you mustn’t have a life, isn’t it all a waste of time, you’d look better with a bit extra weight, imagine how much money you could save on gym memberships or supplements. Then there’s the accusations of he must be on steroids for men and shes starving herself for woman rather than just accepting someone works hard and looks good for it. 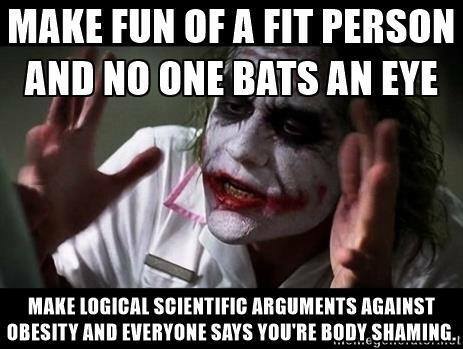 Guess the message here is labelling and ostracising someone for being in shape is just as bad as doing it to someone out of shape and you probably wouldn’t do that.